An American legend has passed — how did Pete Seeger influence our society? 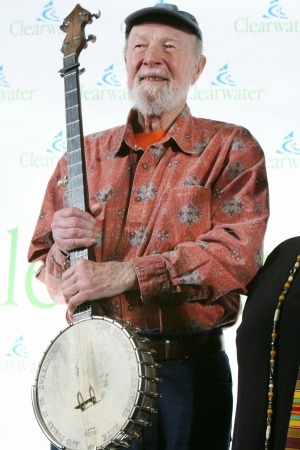 American folk singer and social activist Pete Seeger has died after a short stay in the hospital. He was 94 years old. The singer’s grandson, artist Kitama Cahill-Jackson, confirmed to the Associated Press that Seeger passed away about 9:30 p.m. EST on Monday night at New York Presbyterian Hospital, where he had been admitted six days earlier, surrounded by family — and up until his hospitalization had been the picture of robust health. “He was chopping wood 10 days ago,” Cahill-Jackson recalled. Some of Seeger’s more memorable tunes included “If I Had a Hammer,” “Turn, Turn, Turn,” “Where Have All the Flowers Gone?” and “Kisses Sweeter Than Wine.” His days as a mainstream performer ended in the 1950s when he was blacklisted as a Communist during Sen. Joseph McCarthy’s Red Scare, despite his denials of doing anything un-American. Seeger would not answer any questions regarding his political affiliations and was convicted of contempt by Congress — a decision that was later overturned on appeal. His career was reinvented as he became a pioneer of protest music. His tune “We Shall Overcome” became the soundtrack to the civil rights movement and “Where Have All the Flowers Gone?” became the anthem of Vietnam War protesters. Seeger was predeceased by his wife Toshi in July.